The UC Davis One Health Institute's PREDICT Project has been performing global disease surveillance for more than five years, but the logistics of screening primates for zoonotic pathogens—diseases that can be passed from animals to humans—have often presented a challenge. That is because invasive sampling techniques, such as collecting blood or using oral swabs, require anesthesia in the field. "It's important that we're able to sample wildlife in communities where zoonotic diseases are likely to emerge," said Smiley Evans. "This technique is aimed at helping to make that possible." "This method is already being deployed in multiple countries throughout the world as part of the PREDICT project and is expanding our ability to investigate primate populations that we were previously unable to sample," said UC Davis professor Christine Kreuder Johnson, surveillance lead for the PREDICT project and senior author on the study. "It's important to try and throw the rope without the primate seeing where it came from," said Smiley Evans. "We have to be sneaky. Some species, like macaques, are very bold in urban settings and it's easy to get mobbed by monkeys." 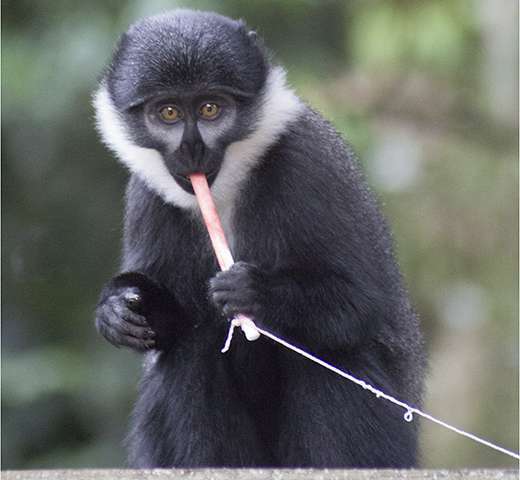 In this study, oral samples were collected from multiple species, including rhesus macaques in Nepal and olive baboons, red-tailed guenons and L'hoest's monkeys in Uganda. A variety of viruses, including herpesviruses and simian foamy viruses, were detected in those samples.